Imagine going into work like you would on any other day. Then, you are surprised with the news that your employer is helping you get one step closer to fulfilling your educational dreams. 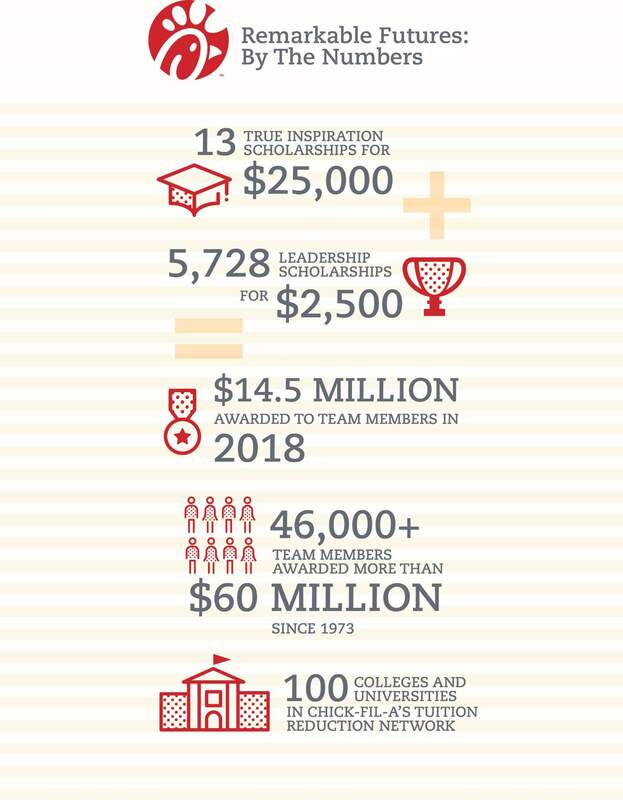 From coast to coast, another 5,700 Team Members will each receive $2,500 in the coming weeks as the restaurant company awards a total of $14.5 million in scholarships through Chick-fil-A’s “Remarkable Futures” education initiative. This year’s total award represents a $5.7 million increase since 2017 — the highest unrestricted per-employee scholarship investment in the industry. Scholarships can be applied to any area of study at any accredited institution, including two- or four-year colleges and universities, online programs, or technical/vocational schools. Chick-fil-A began awarding scholarships in in 1973, when Founder S. Truett Cathy sought a way to incentivize his team members to further their education. Since then, nearly 46,700 team members have been awarded a total of $60.5 million in scholarships. These students have gone on to attend more than 3,000 schools nationwide. True Inspiration Scholarship: In 2018, 13 team members will receive an individual, one-time award of $25,000. Chick-fil-A Leadership Scholarship: In 2018, 5,728 students will receive a $2,500 scholarship for the 2018-2019 academic year. Team members may re-apply for up to four years – for a potential total of up to $10,000 for college while working at a Chick-fil-A restaurant. Educational Assistance Opportunities: In addition to scholarships, Chick-fil-A offers all 120,000 team members, including scholarship recipients, access to tuition discounts of up to 30 percent and other educational benefits at 100 colleges and universities across the country. Both scholarships are awarded based on a Team Member’s leadership, academic achievement and community involvement. (In fact, 2018 scholarship recipients logged a combined 70,000 hours of community service!) The True Inspiration scholarship also factors in demonstrated financial need, and a Team Member’s franchise Operator must nominate him or her for the award. “The best way we can help these team members grow into the leaders of tomorrow is to provide access to educational opportunities today,” Bullard said. In a recent Chick-fil-A Team Member survey, 97 percent of respondents said the scholarship is a benefit to working at Chick-fil-A and 75 percent said they would continue to work at Chick-fil-A because of the scholarship. To learn more about Chick-fil-A’s scholarships, visit chick-fil-a.com/remarkable-futures-scholarships. There isn’t much that can slow down Faith D’An Nixon. At a young age, Nixon pitched in to help take care of her family, providing care and support for her mother, who faced several health ailments and raised Nixon on her own.